This is a perfect winter dish. 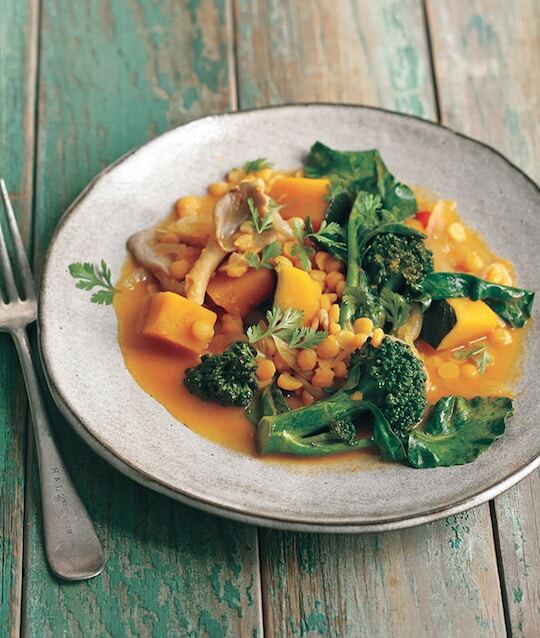 You’ll be wowed by the flavor of this fusion-style dish, where winter squash pairs very well with Thai curry. The mushrooms add earthiness and a lot of texture, while the broccoli (or greens) adds freshness. Excerpted from Vegan Under Pressure: Perfect Vegan Meals Made Quick and Easy in Your Pressure Cooker © 2016 by Jill Nussinow. Reproduced by permission of Houghton Mifflin Harcourt. All rights reserved. Photo © Lauren Volo. 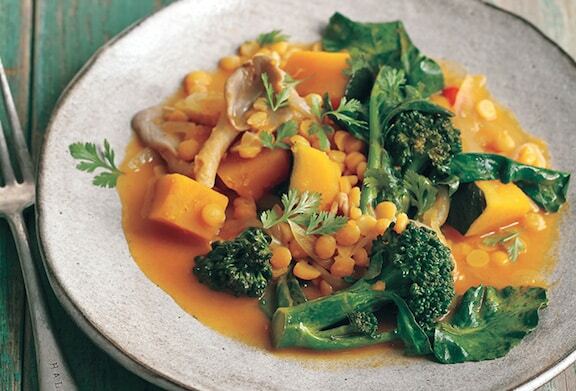 You’ll be wowed by the flavor of this fusion-style dish, where winter squash pairs very well with Thai curry. Heat a stovetop pressure cooker over medium heat or set an electric cooker to sauté. Add the onion and dry sauté for 1 minute. Add the garlic and chile and cook 1 minute longer. Add the chana dal, galangal, lime leaves, ¾ cup of the stock, the coconut milk, and curry paste. Lock the lid on the cooker. Bring to high pressure; cook for 3 minutes. Let the pressure come down naturally. Remove the lid, carefully tilting it away from you. Add the squash, mushrooms, and remaining 1 cup stock. Lock the lid back on the cooker. Bring to high pressure; cook for 3 minutes. Quick release the pressure. Remove the lid, carefully tilting it away from you. Stir in the broccoli. Lock the lid back on and let sit for 2 minutes. Carefully open the lid. Remove the galangal slices. Transfer the mixture to a large bowl. Add lime juice to taste, sprinkle with cilantro, and serve. If you’re not familiar with lime leaves, you’ll likely recognize the flavor if you’ve eaten Thai food. Store the leaves in your freezer so that they are available when you need them. Galangal is a root, similar to ginger, that is used in Thai cooking. Chana dal is split chickpeas, which are used often in Indian cooking. If you can’t find them, split red lentils stand in easily. Here are more global stews.